Jul. 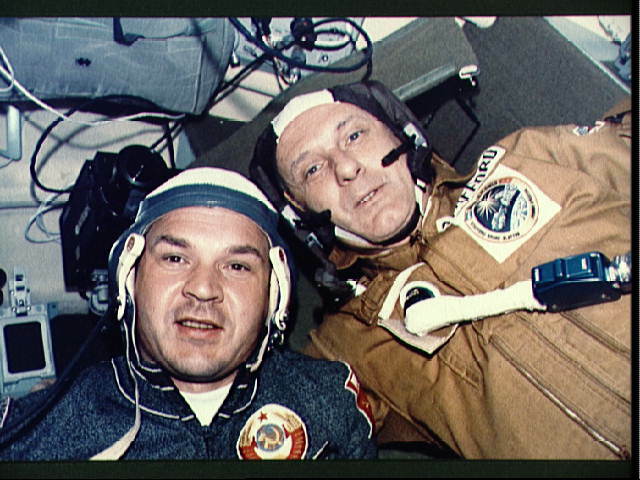 15-24, 1975: The Apollo-Soyuz Test Project was the first international human space flight, taking place at the height of the détente between the United States and the Soviet Union during the mid-1970s. It was specifically designed to test the compatibility of rendezvous and docking systems for American and Soviet spacecraft, and to open the way for international space rescue as well as future joint missions. To carry out this mission existing American Apollo and Soviet Soyuz spacecraft were used. The Apollo spacecraft was nearly identical to the one that orbited the Moon and later carried astronauts to Skylab, while the Soyuz craft was the primary Soviet vehicle used for cosmonaut flight since its introduction in 1967. A universal docking module was designed and constructed by NASA to serve as an airlock and transfer corridor between the two craft. Astronauts Thomas P. Stafford, Vance D. Brand, and Donald K. Slayton took off from Kennedy Space Center on July 15, to meet the already orbiting Soyuz spacecraft. Some 45 hours later the two craft rendezvoused and docked, and then Apollo and Soyuz crews conducted a variety of experiments over a two day period. After separation, the Apollo vehicle remained in space an additional six days while Soyuz returned to Earth approximately 43 hours after separation. The flight was more a symbol of the lessening of tensions between the two superpowers than a significant scientific endeavor, a sharp contrast with the competition for international prestige that had fueled much of the space activities of both nations since the late 1950s.